The by-product gases of BF and LD are burnt before releasing to the atmosphere through Chimneys (known as Flare Stacks). This consists of three chimney heads for main gas each having 4 ignitors with pilot flame burners at top of Chimney. 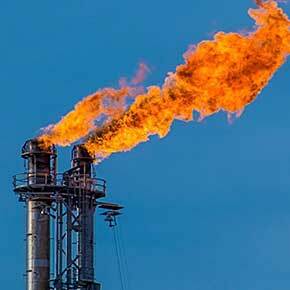 The pilot flame is used for igniting these gases which are positioned at the topmost point of these flare stacks. A detection system (based on the temperature of flame) is available to detect if the pilot flame is glowing. As the pilot flame is invisible during day time and low reliability of flame detection sensors near the flame by temperature sensing impacted by heat and ambient condition of dust & moisture with low maintainability makes it unreliable. The igniter system consisting of an igniter i.e. the spark plug, igniter consisting of electrode & insulators assembly at the top to ignite the pilot burner fired by Coke Oven Gas (COG) with ignition high voltage transformer located at the bottom of Chimney for BFG and LDG at the top of the Chimney. This igniter fails to generate enough spark at the spark tip because of internal insulation failure/low insulation because impacted by heat and ambient condition of dust & moisture with low maintainability makes it unreliable. If loss of pilot flame is not immediately detected, it can eventually lead to loss of the main flame which is needed for flaring the By-product BF gas. Since BF gas has significant CO concentration, this cannot be released in the atmosphere without flaring which otherwise will be a potential safety threat for all working near the stack and to nearby operating units of the Steel Plant. This situation leads to unsafe condition and force stop of Blast Furnace.